Who are Me, But Better? Our client for this project is a company called Dogtooth, an experience design company based in North Yorkshire. These are also the guys that own Wall Glamour, and Startup Stickers. Rick came to me with an idea for an app. Which was to be able write your own custom affirmations on your phone and get regular reminders, which is a key part to the affirmation process itself. Rick had been using someone else’s app, however the app was functional but poorly designed. however the app that was available to do this looked terrible and was frustrating to use, so despite Rick offering feedback to the other app, he got no response, so the next step was to build his own. The next step was to promote the app through a website, so we put together a website that promoted the app in a way that would show it off for how good it actually was. 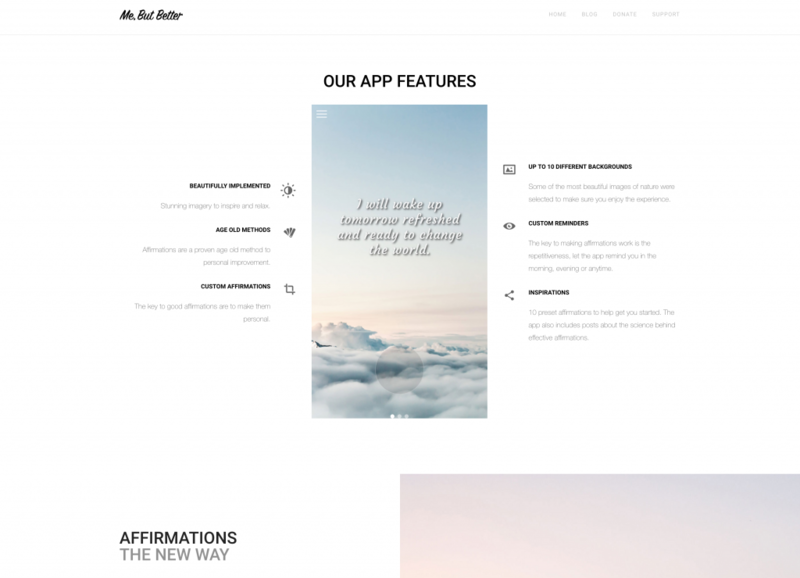 We also focussed on the SEO side of things for this site and, currently if you search for “custom affirmations app” Me But Better comes in at number 1.